“i am so very happy to be a student instead of a teacher for a few weeks. cause teachers need love, too. often my students don’t understand this & don’t want me to go away. but we are no different from them. we are all students who need guidance. and i can’t give if i don’t receive. a teacher who does not continue to study & practice is nothing but an empty vessel with nothing to offer. another pithy bindi comment from from her blog bindifry’s itty bitty brain basket. I emailed her to tell her that I’m lovin’ what she’s writin’ because she’s sayin’ what I’m thinkin’…. 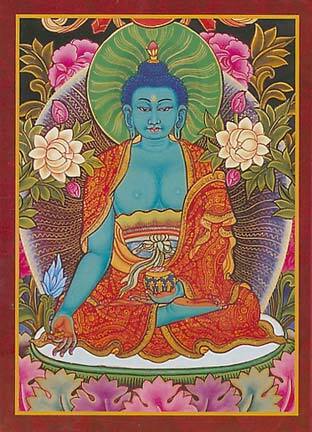 “Medicine Buddha’s blue sky-colored holy body signifies omniscient wisdom and compassion as vast as limitless space and is particularly associated with healing both mental and physical suffering. Making a connection with him, practicing meditation, reciting his mantra or even just saying his name helps us achieve our potential for ultimate healing. I am using my trip to India as a healing mission. I have private classes set up at the yoga school where I will get a private consultation regarding my health, physical and otherwise, and a yoga/pranayama/meditation practice will be prescribed. I will then do my private asana class every day with a senior teacher of TKV Desikachar along with pranayama and meditation classes and a Sutras class. There is nothing seriously wrong with me, at least that I am aware of. A medical procedure I was to have today has been rescheduled. but all this year I have felt “off” and ungrounded no matter how much yoga I did or how much I meditated. I have only myself to blame because I went off my thyroid meds early this year which wreaked havoc on my body. let this be a lesson for y’all: don’t mess around with your thyroid! But in my bones I know it is more than that. being in a state of energetic dis-ease all year took its toll, and then the coup de grace of the dysfunctional yoga studio was the finishing blow on my subtle body, my sukshma sarira. I know that the rage I felt about what happened, while no longer consciously apparent, settled into my subtle body which then manifested physically into conditions relating to the first, second, and third chakras. So I’m going to India to heal myself. India is always psychically healing to me but it is my hope that it will especially be so this time. like bindi’s experience, my students also are never thrilled when I’m gone for a month, but it’s the way it has to be. India feeds me and nourishes me and without it I am just that empty vessel that bindi wrote about. This is only my third trip, but each time I am there I feel like I have always been there. My students know how I feel about India and they always ask me if I am coming back “this time.” Last night a student said that if I don’t come back he’s going to come looking for me which I thought was sweet and funny. I told my students last night that this time I am not bringing anything back. I usually return home with a large suitcase filled with gifts and items to sell like shawls and silk scarves, jewelery, and cool Indian “yoga stuff.” this time I will be selfish — no lengthy travelogue emails home describing every street cow I see or every bit of yogic insight gained. and absolutely no blogging about my adventures. I’ll be in-country and off the grid. So to my friends who read this blog, sorry, but don’t expect to hear from me for an entire month. It’s time for me to lose myself in the arms of Ma India. and whatever happens, happens. it’s time for this vessel to be filled. Previous Post yoga every day? What a great opportunity for you! Be careful though…going off the grid in any country can be dangerous. Ok…now I’m talking like a mom, sorry. Enjoy your trip! I’m completely jealous of your experiences and the experience yet to come. I can’t wait to read the posts when you return. Namasté & Blessed Be. Ah, let the vessel be filled. Have a wonderful, healing trip.